SAALT Hosts Know Your Rights Town Hall in D.C.
Washington D.C.: On Thursday, March 23rd, South Asian Americans Leading Together held the first in our series of national community town halls to discuss pressing issues for our communities including hate violence, immigration, and policies such as the “Muslim Ban”. The recent spike in hate violence aimed at South Asian, Muslim, Sikh, and Hindu communities is part of a dangerous trend electrified by the 2016 election cycle and the current administration. 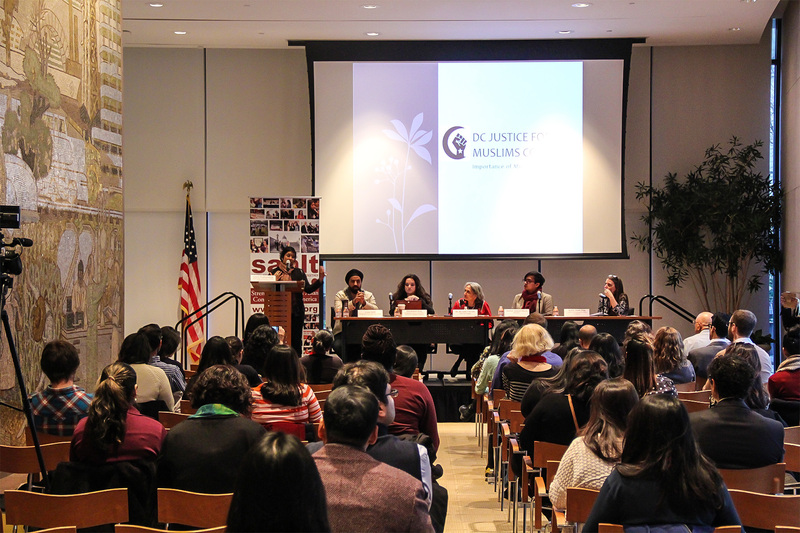 Speakers and community leaders included Arjun Sethi of the Georgetown University Law Center, Dr. Revathi Vikram from ASHA for Women, Shabab Ahmed Mirza of KhushDC, Darakshan Raja from Washington Peace Center, and Saba Ahmed from Capital Area Immigrants’ Rights Coalition. Panelists discussed the latest executive orders on immigration, the rising tide of hate violence nationwide, the history of violence impacting South Asian, Muslim, Sikh, Hindu, and LGBTQ communities, and local organizing efforts to defend rights and demand justice. Attendees also participated in a know your rights training on immigration and deportation defense as well as a question and answer session. Immigration and Customs Enforcement (ICE) Know Your Rights pocket cards (prepared by Asian Americans Advancing Justice-Atlanta, Sikh Family Center, and Maitri) in Bengali, Burmese, Gujarati, Hindi, Nepali, Punjabi, and Urdu languages. For additional information on the town hall and how to host one in your community, email us at info@saalt.org. 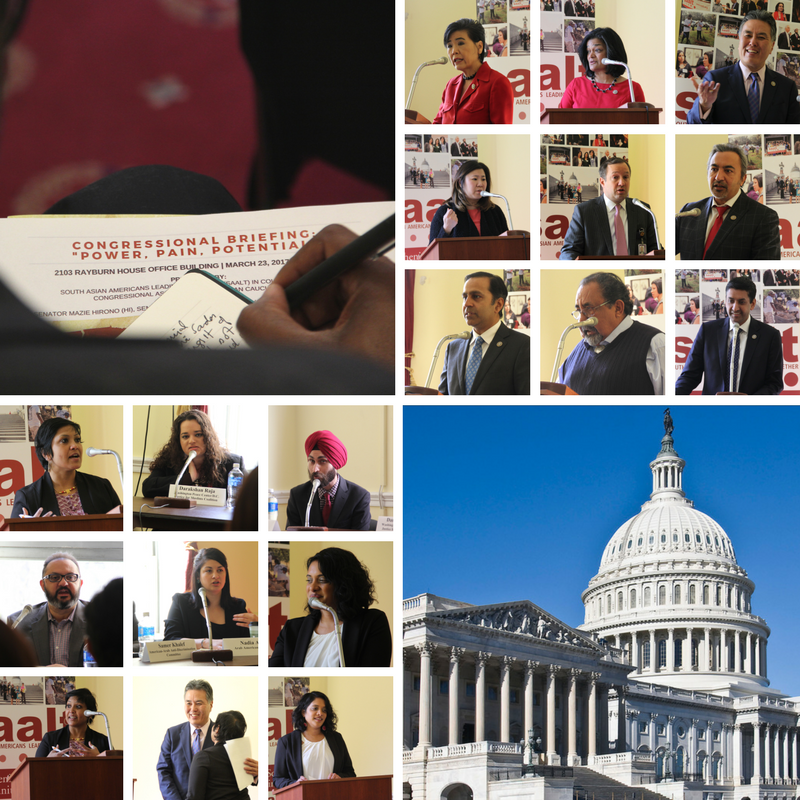 On March 23, 2017, South Asian Americans Leading Together (SAALT), a national South Asian civil rights organization, held a Congressional briefing to address the uptick in hate violence nationwide and highlight recommendations for change, as outlined in our recent report, “Power, Pain, Potential.” SAALT was joined by eight members of Congressional leadership and community partners in an urgent discussion on combatting the surge in hate violence aimed at South Asian, Muslim, Sikh, Hindu, Arab, and Middle Eastern Americans across the country. Our communities have experienced devastating violence in recent months, including deadly shootings in Kansas and Washington State, numerous arson attacks and vandalism of mosques, businesses, and homes nationwide, and mounting fear by our communities across the country. 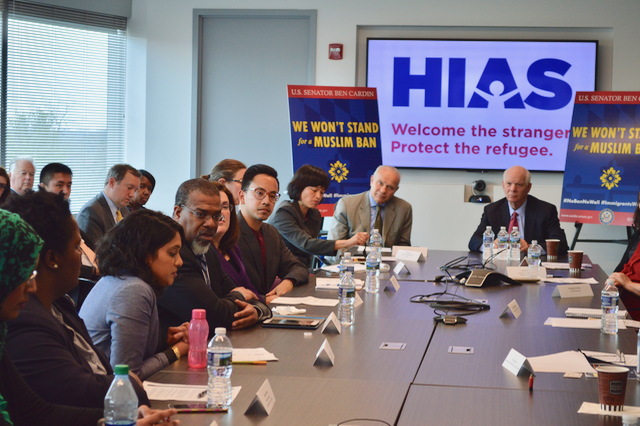 On March 20, 2017, South Asian Americans Leading Together (SAALT), a national South Asian civil rights organization, joined Senator Ben Cardin (D-MD) and organizational leaders for a roundtable discussion on the devastating impacts of President Trump’s “Muslim Bans” and the important judicial rulings that have stifled their enactment. The nation continues to experience a blinding uptick in anti-Muslim, anti-immigrant hate violence, emboldened by the President’s virtually identical “Muslim Bans.” In two months our communities have experienced deadly shootings in Kansas and Washington State, arson and vandalism of mosques, businesses, and homes nationwide, and the heavy weight of fear and uncertainty experienced by our communities across the country. The violence currently facing the nation is building on the toxic momentum of the 2016 presidential election. SAALT’s latest report, “Power, Pain, Potential,” documents over 200 instances of hate violence and xenophobic political rhetoric during this historically divisive election cycle, with 95% of incidents animated by anti-Muslim sentiment and 1 out of 5 xenophobic comments emanating from then-candidate Trump. 2017 has been a banner year for hate. What we’ve learned in these short months is that words matter, words can be deadly, and words properly measured can be the key to justice. SAALT is listening. 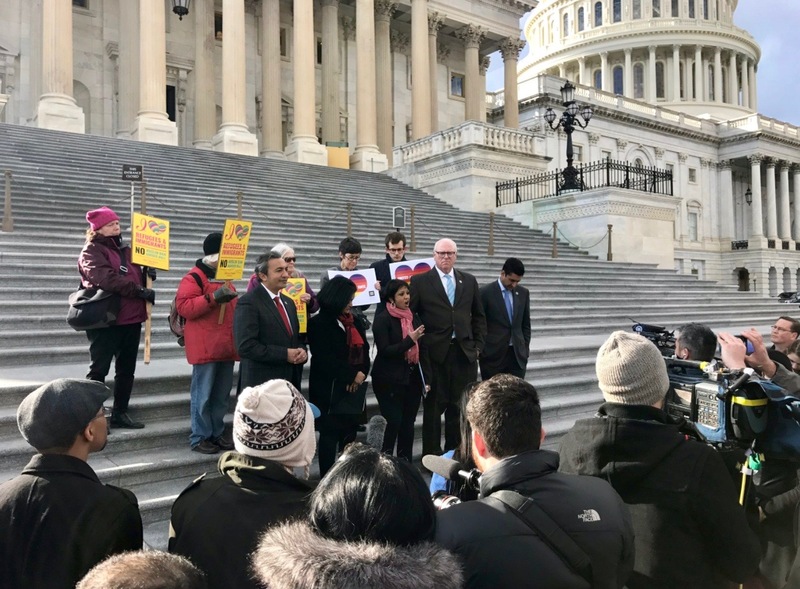 Today in Washington, D.C., South Asian Americans Leading Together (SAALT), a national South Asian civil rights organization, along with partner organizations and Members of Congress, held a vigil on the steps of the Capitol to honor the victims of hate violence in South Asian, Sikh, Muslim, Hindu, and Arab communities nationwide. The vigil was a collective moment to mourn the injuries and loss of life our communities have suffered and to also demand just laws, policies, and leadership in response to increasing violence against our communities. In recent weeks three Indian men and one Sikh man, either perceived as Muslim or as a result of anti-immigrant sentiment, were shot, with two of the victims ultimately dying of their injuries. In two of the cases the assailants screamed at their victims to leave the U.S. and go back to their countries before opening fire. The nation has also witnessed spikes in mosque burnings, vandalism, and an increasing wave of intimidation aimed at our communities nationwide. This recent violence is part of a rising tide of hate targeting our communities. SAALT’s latest report, “Power, Pain, Potential,” documents over 200 incidents of hate violence and xenophobic political rhetoric aimed at South Asian, Muslim, Sikh, Hindu, Arab, and Middle Eastern Americans during the 2016 elections, with an astounding 95% of incidents motivated by anti-Muslim sentiment. Notably President Trump was responsible for 21% of the xenophobic political rhetoric we tracked. The President’s response to the attacks against our communities has been woefully inadequate. His dangerous rhetoric and destructive policies have fanned the flames of violence that we’ve experienced in recent weeks and months. SAALT calls upon the President to reverse course and lead our nation down a path of justice, inclusion and equality for all Americans. This is the moment for our nation to come together, and SAALT will continue to fight until our country has reached that important goal. Members of Congress who joined the vigil included Congresswoman Pramila Jayapal (D-WA), Congressman Ami Bera (D-CA), Congressman Joe Crowley (D-NY), and Congressman Ro Khanna (D-CA). Partner organizations include: American-Arab Anti-Discrimination Committee (ADC), Arab American Institute (AAI), Council on American-Islamic Relations (CAIR), Desis Rising Up & Moving (DRUM), Indiaspora, MPowerChange, National Council of Asian Pacific Americans (NCAPA), National Network For Arab American Communities (NNAAC), Sikh American Legal Defense & Education Fund (SALDEF), and Sikh Coalition. South Asian Americans Leading Together (SAALT), a national South Asian civil rights organization, strongly condemns President Trump’s revised and stubbornly racist Executive Order effectively banning Muslims, rejecting refugees, and expanding surveillance on Muslim-American communities under the guise of national security. “In a twisted dance of trial and error, the President continues his dogged pursuit of a Muslim ban despite national outrage and a unanimous Ninth Circuit decision blocking enforcement of his original Order,” stated Suman Raghunathan, Executive Director of SAALT. “No matter the legal gymnastics, this latest order is a thinly veiled assault on Muslims, immigrants, people of color, and the founding ideals of equality and freedom in the United States. Today’s order targets immigration from six Muslim-majority countries deemed terrorism-prone, despite the Ninth Circuit pointing out that the government provided no evidence to justify this claim. The President’s original order curtailed rights, broke up families, denigrated Muslims and immigrant communities, and today’s order threatens to do the same. Carving out exceptions for some immigrants does not make this order any more acceptable. “I’m here following through on what I pledged to do, that’s all I’m doing” noted President Trump in a recent press conference. This is indeed true. SAALT’s recent report, “Power, Pain, Potential,” documents over 200 incidents of hate violence and xenophobic political rhetoric against South Asian, Muslim, Hindu, Sikh, Arab, and Middle Eastern Americans during the 2016 elections, with 94% of incidents motivated by anti-Muslim sentiment and President Trump responsible for 21% of the rhetoric we tracked. Trump’s dangerous combination of rhetoric and policies has fanned the flames of violence, including the deadly February shooting of two Indian men in Kansas and this weekend’s shooting of a Sikh man in Kent, Washington. The assailants in both cases told the victims to leave the US and go back to their countries before opening fire. In the last seven weeks four mosques have been burned, numerous homes have been vandalized, and threats have routinely been made against our communities. The fear, intimidation, and anxiety carried by millions in our communities everyday are the invisible wounds produced by this administration’s reckless policies that continue with today’s revised Executive Order. SAALT calls upon the President to immediately reverse course and end his campaign against Muslim and immigrant communities. It is time for the White House to set the tone for our nation and turn its back on poisonous rhetoric. It is time for our nation to begin to heal from the violence.